Raising Z and Lil' C: Good Bye Plastic Bags......Give-Away!!! After going paperless in the kitchen, I started to look around to find other places where we could reduce our household waste. After finding our messy collection of plastic zip bags under our sink, I knew my search was over. I found this great site called Reusablebags.com where they have everything you could ever imagine for food carrying and storage. This website not only has a great selection, it also has so many wonderful features; excellent product descriptions, lots of customer reviews and inexpensive shipping. After a lot of research and a budget of $40 or less.....I settled on two ReUsies™ snack bags and a 3 pack of Wrap-N-Mats®. I am so happy with my purchases and though I typically don't do reviews on this site, I wanted to share w/ you how much we really love the ReUsies™ bags!!! We have been using these bags for a month now and I must say that we use them every day. I have packed the bags with crackers, cookies, muffins, pretzels, baby carrots, sandwiches and everything always tastes great. I have even left crackers over night and they were not stale (although they can't guarantee freshness overnight :)! I love the fun designs and the fact that the velcro is strong enough to keep the snacks in but easy enough for Z to open it. 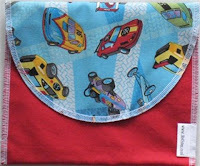 The bags are so well made, they are 100% cotton on the outside and the inside is lined with water-resistant 100% nylon (BPA, Lead and Phthalate free). This makes it so easy to keep them clean. I just rinse them out with some water from the sink and then let them air dry. You can also wash them in the washing machine (you need to flip them inside out) or in the dishwasher. The company was created by two moms out in Seattle who were trying to reduce their family's carbon footprint :) They are a very friendly company with a wonderful website and product and I highly recommend it to you. I wrote the the ReUsies™ company and told them how much I loved their product and asked if I could give my readers a coupon to try out the product at a discount. They said that they would do something even better......they sent me out a sandwich sized bag to try (as well as another snack bag) and told me that that they would send one lucky reader a set as well! So here is your chance to win your own set of ReUsies™ snack and lunch bags. I know you are going to LOVE them. WOW - You know I would love to win the bags because I am trying to reduce our carbon footprint too! Super awesome. I can't decide between the birds and bubblicious???? i would LOVE to win these bags because i have been looking at this option for awhile ... i just haven't up and purchased! and if i love them? i may just be purchasing more of my own! my daughter mentioned that she is kind of sick of all the tupperware in her lunchbox ... it makes it hard to repack! poor girl ... but i'm just not willing to fill up the box with a bunch of plastic baggies! I'd love to win these bags! I've been trying to eliminate plastic by sending hubby's lunch in glass containers that I bought at Crate and Barrel....and these would be the prefect addition! I would love to win these bags because we use plastic ones way to often! I would like to win because these would be great for Audree-Ann's school lunch and when we go on day trips! I love that the bags do not contain lead, BPA, or other harmful chemicals. I have been looking for an alternative for my son's lunch instead of baggies or plastic containers and ReUsies sound perfect! I like their Personal Picasso bags - I think my children would love designing their own sandwich/snack bags! Subscribed to the ReUsies newsletter! Pick me Z!!! I would love to try these out as we make our lives less dependent on plastic. 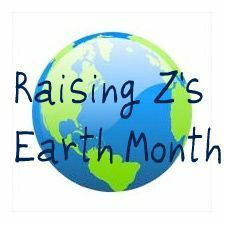 This month we are doing an Ecology Unit to go along with Earth Day in my third grade class. We talked about ways the children could help. One of the boys brought out one of the Reusie bags to share. Then two others jumped up and got their Reusies out of their lunchboxes. This was the first time I had seen them, until Z came over with his "fishies" in this really cool bag. I think it is a great idea and lets kids do their part in helping "Mother Earth". Way to go! I like the blue stepping stones bag. Saw some cute ones for G. Have to check with L.
These are great!! I am always looking for ways to reduce the amount of stuff we constantly go through and throw away in our house. Even if I don't win I am going to go on and buy some of these! They sound great and I'd love to win so I could try them! I subscribed to the ReUsies Newsletter. Iwould love to win the bags - we have recently gone paperless as well and this would be a great addition to our efforts since my next step is to go plasticless in the kitchen. i like funky dots, asian blu and stepping stones.